The period of funding for the FOODplus Research Centre has come to an end and FOODplus wound up at the end of 2017. 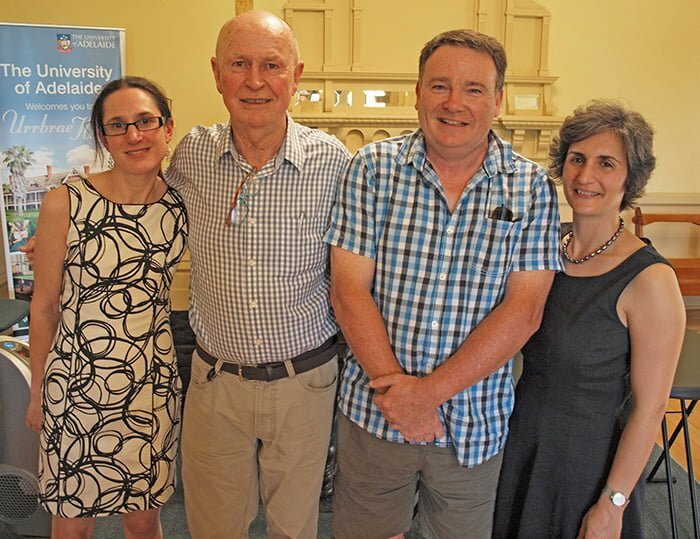 The substantial achievements of the Centre over the last nine years were celebrated at a function at Urrbrae House on 21 November 2017. Since its inception in 2009, the vision of the FOODplus Research Centre has been to improve the lives of young families through research excellence in food and nutritional sciences. Based at Waite within the School of Agriculture, Food and Wine, FOODplus was established as a joint venture of the Child Nutrition Research Centre at SA Health & Medical Research Institute (SAHMRI) and the University of Adelaide to develop research sustainability in food and nutrition as it relates to human health. FOODplus research has covered a broad range of areas linking food, nutrition and sustainable agriculture to improve human health. Projects have connected health researchers with plant and animal scientists, growers and food producers for the development of nutritionally enhanced foods for better outcomes for all. “We have developed strong, practical research projects in partnership with the SA Government and industry,” said FOODplus Director, Professor Robert Gibson. This work has included conducting the largest nutrition clinical trials ever done in pregnancy and preterm infants; developing a process for stabilising dried blood spots for monitoring a range of nutrient levels, even after storage for long periods at room temperature; the development of high omega-3 eggs for Solar Eggs and gluten free rolls for Riviera Bakery. Through the hard work of the staff and students over the years, FOODplus has become a world leader in research related to the nutritional health of mothers and their babies. Recently announced NHMRC funding of $2.5million over the next 5 years will see FOODplus evolve into a Centre of Research Excellence in Targeted Nutrition to Improve Maternal and Child Health is testament to this. Similarly, the analytical capacity built up over the life of FOODplus is set to evolve and expand through spin-out company Trajan Nutrition, a commercial collaboration between Trajan Scientific, SAHMRI and the University of Adelaide. The company will have three approaches – analytical, R&D, and information translation direct with consumers to improve diets through real foods rather than supplements and to improve health outcomes in the community. Likewise, the applied work that FOODplus has been doing with small and medium sized South Australian food businesses over the last few years will continue and evolve within the Food Innovation program through the Waite Research Institute. We can all feel justifiably proud of and pleased with these successful outcomes. This entry was posted in News, School of Agriculture, Food & Wine, Waite Research Institute and tagged food, research. Bookmark the permalink.